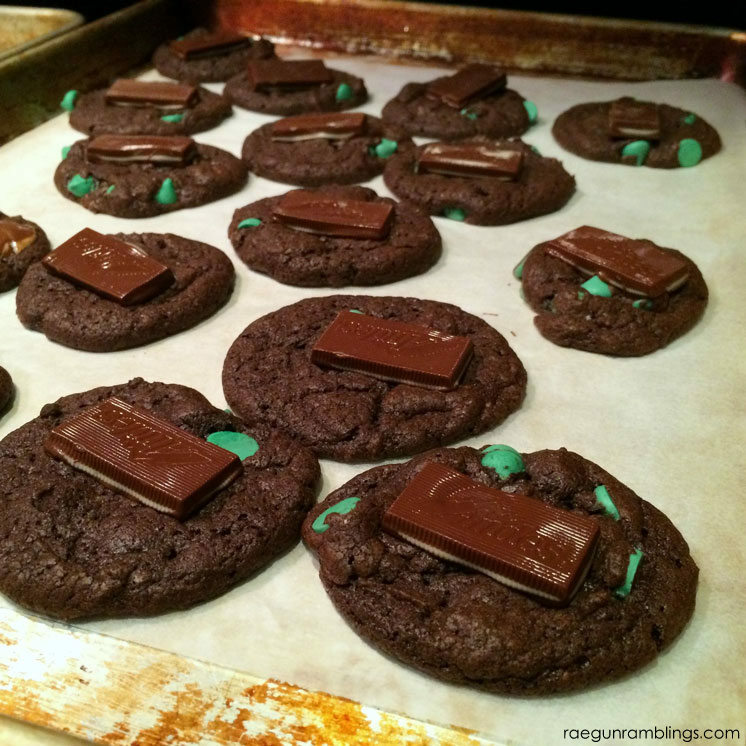 Are you one of those Thin Mint Cookies junkies? You can tell me. I honestly wasn’t setting out to make a thin mint Girl Scout cookies copycat recipe but today at my church Christmas party one of the ladies said, “wow these taste just like a thin mint, but not as dry” and I thought yes, yes they do (plus the other gals around agreed). I have a confession. I am not a thin mint fanatic. They are way too dry for my tastes. But these while being a dryer cookie than I normally eat are perfect. They are not a full soft doughy cookie like the Lemon White Chocolate Chip cookies I shared last week but they don’t give me that dry mouth feel that I always hated with the Girl Scout cookies. Now I will warn you. These aren’t copy cat in the sense of you can stick them in a box and call them thin mints, but they sure do TASTES just like those highly favored morsels. ANd these are SOOOO easy and SOOOO much cheaper than those arm and a leg ones in the green box. Mix together everything except the chocolate chips and mints. Once combined stir in the chocolate chips. Drop onto a cookie sheet in 1 inch scoops. Keep it small these spread a lot! 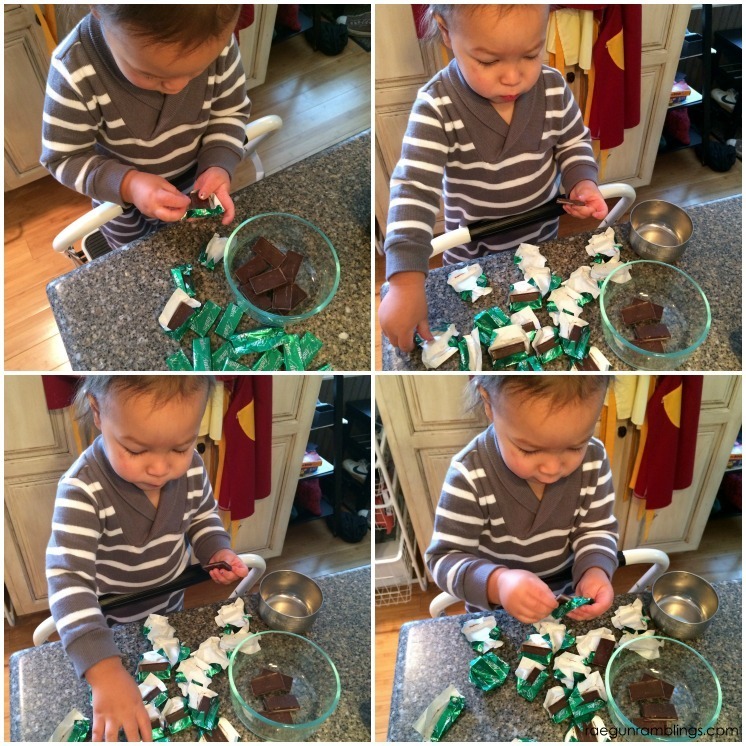 Remove from oven and immediately top each with an unwrapped Andes mint. The heat from the cookie should melt the chocolate and when it does take a knife and spread it around to make the icing. If your mints don’t get spreadable you can pop the cookie sheet back in the oven for a minute. Fresh from the spreading these puppies are CRAZY addictive. 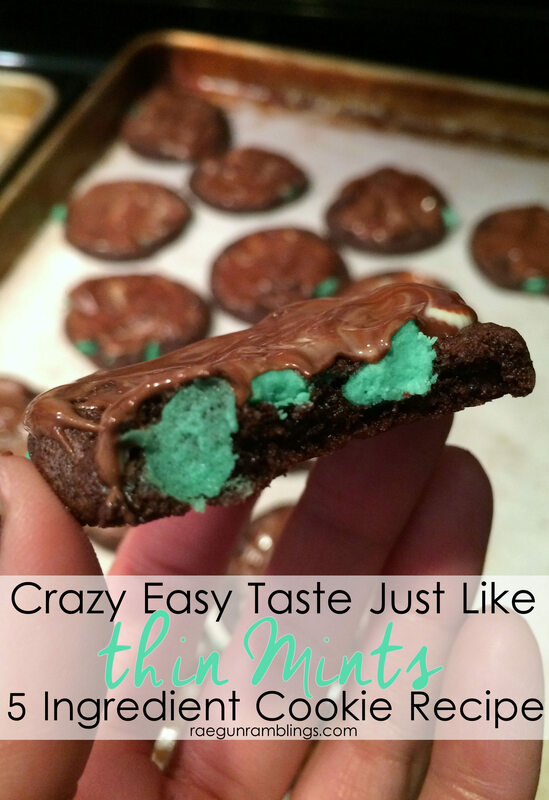 I love love love the melty chocolate mint topping and the soft mint chips inside. 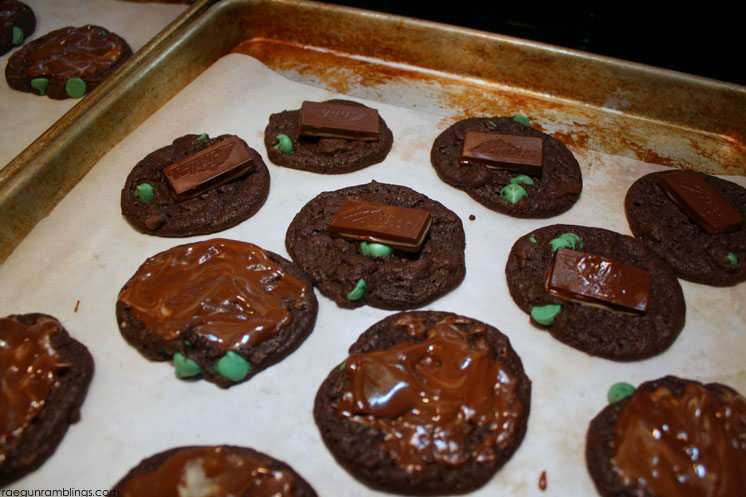 But once they cool and the icing/candy hardens the cookies take on the thin mint tastes. Make sure you try them both ways! I have been popping mine into the microwave just since I have a weakness for warm cookies and melted chocolate but at the party today the tray of cookies was cleared crazy fast! I don’t bake like I use to but I definitely need to try this recipe. 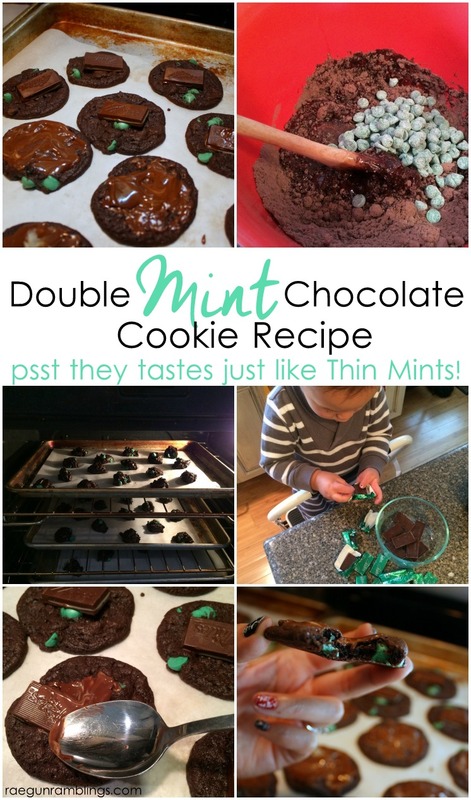 They look delicious and to have the flavor of the Girl Scout Thin Mint cookies year round. Need I say more? Oh, my goodness, those cookies look so good! My brother-in-law might actually cry if I made these cookies for him. I swear, he gets so excited over getting girl scout mint cookies that he shakes! These look delicious! Thanks for sharing! Thanks for linking up at the delicious dishes recipe party. Oh that’s so funny you totally need to make them for him!